Bringing to the stage the bizarre, the grotesque, the decadent, the macabre, and the self-consciously artificial, resurrecting European classic plays in new translations, adapting unadaptable novels, re-imagining works of the English stage canon, and producing gleefully strange new writing from London to Oxford to Edinburgh and beyond. We believe that the best theatre is over-ambitious, visually arresting, and utterly unexpected. Influenced by the styles of Georgian directors Robert Strurua and Levan Tsuladze, by immersive theatre companies like Punchdrunk and Third Rail Projects, we seek to create a new, modern mythology. We're currently working on Midnight at the Rue Morgue: The Madness of Edgar Allan Poe, a devised, interactive piece, for touring performance in Spring/Summer 2013. 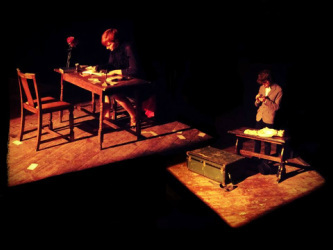 Previous work has included O Human Child, an experimental piece of "new editing" fusing the works of Shakespeare, Yeats, Rossetti, and Keats, a new adaptation of Gormenghast, promenade interpretations of Three Sisters, new translations of Pirandello, and new writing at the Edinburgh Fringe. Visit our sister production company, Reverend Productions.